In the Japanese stock market, Japanese exporters have been depreciated due to the strengthened yen, but some of them are dumped too much. Especially Wacom, the graphics tablet maker that holds the 80% of the market share in their market, has been dumped to the price at which the stock was traded before Abenomics. Since then, however, the yen has been depreciated by 20%, and the company’s revenue has grown by 30%. This article explains why it’s a great buying opportunity, by mentioning the brilliant growth of the market of tablet computers, which affects the company’s revenue very much. The revenue growth is extraordinary. It grows by 10-30% every year, and the profit follows it accordingly. This is because the company’s business continues to expand together with the tablet computer market, keeping its market share quite high. As long as it keeps the market share, if the tablet computer market grows, the company’s business does either. 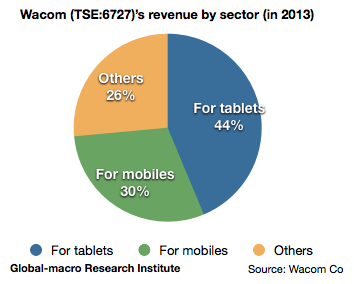 The 44% of the revenue is from the products for tablet computers, and the 33% is from those for mobile phones. Although the company’s plan may possibly overvalue the future growth of PCs with a touch display, it wouldn’t be a enormous problem. Gartner predicts that the growth of the tablet computer market will continue to be brilliant, and as long as Wacom keeps the market share, its revenue is expected to follow. Although the Japanese market has still been depreciated since it hit the highest last year, what investors can do in such a situation is just to buy what is obviously reasonable, estimating where the bottom should be. As the influence of the tax hike appears on the statistics, the cheap will be bought, and the expensive will be sold. Until then, however, the entire market has no trend, just observing a huge amount of long positions piled since late 2012. Make sure, therefore, that the exposure to the Japanese stock market shouldn’t be too enormous.